These tragic events underscore the need to move toward greater uniformity in codes and standards to ensure consistent application— from the initial design phase to final construction — in order to eliminate ambiguity and establish the highest level of fire protection in all corners of the world. Code development is generally done by Standards Developing Organizations (SDOs) in the United States, or internationally by ISDOs. These model codes serve as the basis for most building regulations, which may be amended or overridden by local bylaws or government agencies. In Europe, the prevailing standard is adapted by fire protection oversight organizations and then further altered on a country- by-country basis. 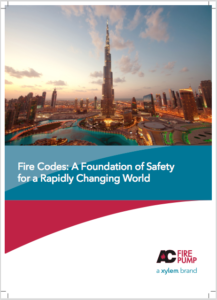 In emerging markets such as the UAE and China, government leaders have adopted some of the existing codes and standards from developed markets, including the U.S. and Europe, to advance fire protection. Closer examination of the standards that apply to pumps for fire protection shows the differences that exist among the predominant standards and underscores the importance of proper design and installation of fire pumps. These standards should be considered in the context of whole system performance and redundancy in fire safety systems to reduce the risk of death, injury and property damage. It’s important to note that these various codes and standards on fire protection are not equal, interchangeable or enforceable by SDOs/ISDOs. Adoption of safety standards often is decided on a local level by officials who weigh cost of compliance with acceptable levels of risk. This is a complicated and subjective formula — a balance among political, economic, business competition and other factors, and the value placed on safety and what is willing to be sacrificed for that safety. Other organizations, such as listing authorities like Underwriters Laboratories (UL), which governs electrical standards, and Factory Mutual Research Corporation (FM), a global insurer, influence building design and code development. These testing and certification organizations develop their own standards as well —UL Standards cover fire pump controllers, fire pump motors and fire pump relief valves, and are important third-party certifications for manufacturers to obtain. Both UL and FM representatives sit on technical committees that review and develop standards, such as the NFPA Technical Committee on Fire Pumps. Further, in areas where local codes are weak or not enforced, listing authorities are sometimes regulators by default in cases in which their standards are more stringent. When the Standard for Installation of Stationary Pumps for Fire Protection known as NFPA 20, added multistage, multiport pumps as part of its 2016 update, it prompted FM to add multistage pumps to its FM 1311 standard for centrifugal fire pumps, improving safety in areas where FM regulations are the predominant standard. Manufacturers of fire protection equipment also play an important role in shaping technical regulations on fire protection. They can affect codes and standards in advisory roles as noted above and also through the development of new products. Products with improved technologies, for example, can affect the operating procedures within fire protection systems or, if technology outpaces system capabilities, expose system vulnerabilities. For instance, NFPA’s Technical Committee on Fire Pumps is considering the need for a common means to remotely access fire pump controller data; currently, each manufacturer has a proprietary means. Also, as construction practices evolve, codes become obsolete and refinements must be made to these living codes. In order to keep pace with these inevitable changes, American standards that fall under the auspices of the American National Standards Institute (ANSI) must be reviewed at least every five years — NFPA updates codes every three years. CEN, the European Committee for Standardization, conducts a systematic five-year review of its standards. The European insurance federation known as CEA, updates its requirements every two to three years. During the interim periods, technical bulletins are issued as warranted. Without question, the fire pump is one of the most critical pieces of equipment inside a building. The pump takes water from an external water supply, such as a public utility or reservoir, and provides the required water flow and pressure for the fire protection system. Reliable, code-compliant fire protection systems begin with the consulting engineer or designer, tasked with meeting the overall project objectives and selecting the necessary systems for the project. He or she must be knowledgeable in each component of the system and understand how each component will affect the selection of another component, and how they will all work together. The development of codified performance-based approaches to system design has begun to present designers with the necessary tools to better anticipate the building’s performance in the event of a fire and a clear assessment of risks in terms of the overall project objectives. 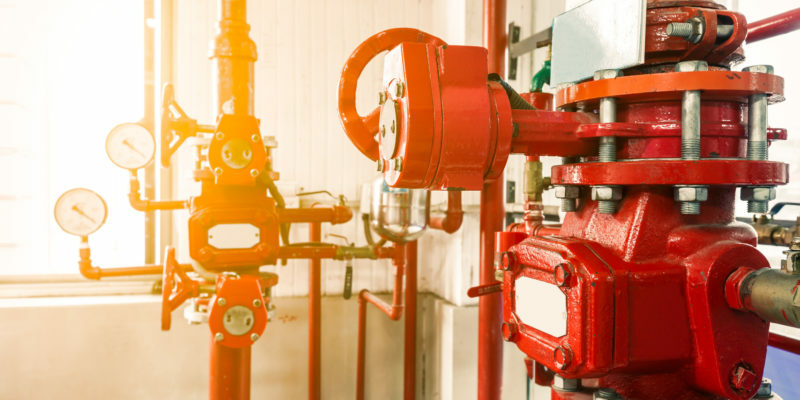 Standards governing fire pumps are most often included in broader guidelines for automatic sprinkler systems as the fire pump is a crucial part of the overall system. Some standards are loose guidelines for further code development; others that are more detailed and complex are designed to account for all conceivable scenarios in order to ensure maximum protection. The Standard for the Installation of Stationary Pumps for Fire Protection is the most widely recognized standard in the world, issued by the U.S.- based National Fire Protection Agency and prepared by NFPA’s Technical Committee on Fire Pumps. The committee consists of more than two dozen members and nearly two dozen alternates representing fire departments, fire equipment manufacturers, listing authorities, government, academia, engineering, insurers, associations, unions and other groups. NFPA 20 is considered the most stringent of all the leading codes with its many redundancies and safety measures. Unlike other standards, NFPA 20 addresses the entire fire pump room — the pump, driver, controller, as well as water and fuel supplies, valves and other ancillary equipment necessary — to ensure each of the individual components will perform as a whole if the system is activated. This is a critical distinction between NFPA 20 and other standards, which might simply require UL and FM (or similar) certified components and not take into account if those components will function properly together. (UL and FM certifications are fully compliant to NFPA 20.) In addition, NFPA 20 requires a single entity bear responsibility for all of the components in regard to installation, compatibility, performance and acceptance of equipment. FM specifies this be the pump manufacturer; UL does not specify the entity. NFPA standards are implemented internationally, advancing the development of standards for fire and life safety in many countries. Section 913 of the International Fire Code addresses the protection of the fire pump room within the building and defers to NFPA 20 for the installation and testing of fire pumps. In addition, NFPA has agreements called Memorandums of Understanding with standards-setting groups in more than a dozen countries, most recently adding the UAE in 2016. The primary purpose of each MOU is to promote the adoption of NFPA standards. In Europe, BS EN 12845 offers best-practice recommendations for the design, installation and maintenance of automatic sprinkler systems, and includes fire pumps. It is derived from EN 12845, developed by the European Committee for Standardization, known as CEN, which works with the standardization bodies of 33 European countries. The first EN (European Norm) sprinkler installation standard was issued in 2004 and revised in 2009 and 2015. Prior to that time, insurance companies in individual countries shaped fire protection rules. As countries add their own standards to the nonbinding EN 12845, the country standards supersede the EN code. British Standard (BS) is the United Kingdom implementation of EN 12845 and covers classification, routine testing, design, maintenance, water supply, extension, installation and special hazards related to sprinklers. and pump curve stability. EN 12845 eliminates the requirement for stable pump curve with steadily declining head, but LPC has deemed this an important requirement and retained it in its 2015 standards. It’s important to note that while fire pumps are included in these standards, the BS EN 12845 is not a pump standard and lacks the detail of NFPA 20, and also differs from LPCB, mentioned below. The CEA is the European insurance and reinsurance federation. The CEA 4001 standard specifies requirements and recommendations for the design, installation and maintenance of fixed fire sprinkler systems in buildings and includes a chapter on pumps. CEA 4001 is based on EN 12845, with some updates and additional requirements. VdS, owned by the German Insurance Association, uses CEA 4001 as the basis for its standards relating to the planning and installation of sprinkler systems, known as VdS CEA 4001. The standard covers pumps, drives and controllers, but not as comprehensively as the NFPA 20 standard as it focuses on the individual components, and not the ethicacy of the system. Unlike BS EN 12845 and CEA 4001, the Loss Prevention Control Board (LPCB) issues a standard specifically for centrifugal pumps used in pump sets in automatic sprinkler installations. The LPCB is the certification arm of BRE Global Ltd., based in the UK. It incorporates Loss Prevention Standards (LPS) for automatic sprinklers, BS EN 12845, LPC sprinkler rules and technical bulletins in its LPS 1131: Requirements and testing methods for pumps for automatic sprinkler installation pump sets. Included in LPS 1131 are definitions of the types of centrifugal pumps covered in the standard, however, it does not include requirements for the pump set driver or controller, a critical distinction between this standard and NFPA 20. An important function of LPCB and VdS is to conduct third-party testing and certification internationally to ensure that components, equipment, systems and services comply with the standards for fire protection. In its testing, VdS Inspection Services also includes other standards, such as those produced by NFPA and FM. In its evaluation of products, LPCB considers the manufacturer’s specifications for performance and construction. Once a product, service or company is certified by LPCB, it is listed in the Red Book, a resource for system designers and others involved in fire protection. Installers who receive third-party certification ensure that standards are met in designing and installing sprinkler systems for fire protection. Third-party certification is valuable for manufacturers because it demonstrates their products conform to recognized safety standards, reducing liability. In addition, system designers who specify certified products have confidence the products will perform in accordance with their stated specifications and intended purpose. The table at right provides a comparison of the consensus fire codes that reflect recent improvements and modifications in the field of fire protection. By 2030, the world is projected to have 41 mega cities with more than 10 million inhabitants. Most of those places today are medium-sized cities and cities with less than 1 million people. Rapid urbanization will pose opportunities and challenges in every segment of society — socially, politically, environmentally, economically — including the built environment. As our world continues to grow in complexity, codes and standards that help shape our built environment will continue to evolve in order to protect health and safety for all. The codes of tomorrow will likely include things not even being contemplated today. Brian Buscher is a global marketing manager for Xylem’s A-C Fire brand with expertise in centrifugal pump systems for fire suppression in industrial and commercial facilities. He is a principal member of the NFPA 20 Technical Committee on Fire Pumps. Buscher holds a bachelor’s degree from Northeastern Illinois University. Any comments/opinions made are the author’s own and not those of NFPA.